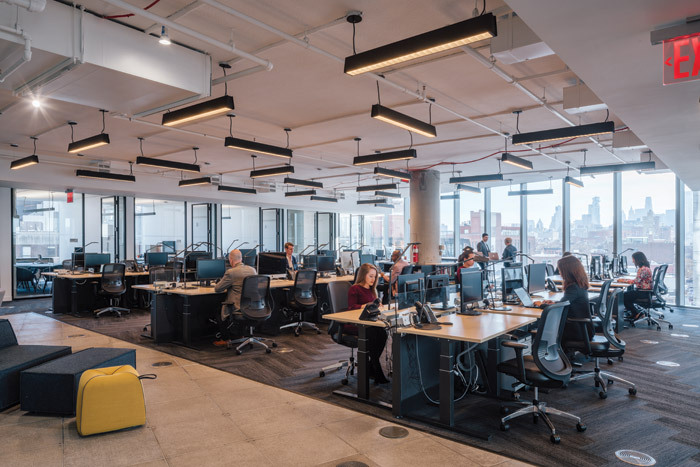 The programme focused on these shining examples, offering the design community a different way of looking at the delivery of an employee-centric workspace. Through a series of ‘working workplace’ tours and fringe events – with all proceeds donated to the I Have A Dream Foundation (New York), a charity that provides social, emotional and academic support to young people from low-income communities – the week addressed how the workplace can be used as a powerful talent attraction and retention tool. IPG Mediabrands, DELOS, Structure Tone and Nickelodeon were just some of the big names participating in the week, complemented by sessions from top workplace commentators including Ted Moudis Associates, HOK and Leesman. They joined the line-up to share their workplace stories, starting with the rationales that underpinned the transformations. For some, it was about creating a vision for the company. For others, it offered the chance to zoom in on their brand’s identity. Then there were the organisations that wanted the design and management of the workplace to ‘say something’ about their employees, and to capture the collective persona. For others, a sense of place was paramount. Aside from one or two self-confessed ‘wow factor’ obsessives, most design teams were keen to embed a sense of transparency to help their clients shift from a hierarchical structure to a flat, more-inclusive model. To create a sense of social cohesion, more organisations are investing into town hall-esque spaces, common areas and neighbourhood zones – one workplace even had an on-site beer garden. In the pursuit of transparency, glass walls are in abundance. The boardrooms of yesteryear are no more. These days, executive staff are more visible and approachable. Managers no longer have the cosy, coveted corner offices that were once a default offering to reflect their seniority. This has resulted in a disillusionment of power, and with that comes empowerment of the people. What’s more, there is greater choice than ever before – would-be staff can decide where and how they work. For the offices that have abandoned assigned seating, there remains a place and a space for personality – and employees are still able to leave their mark. Artwork and photographs lines many an office wall in NYC. And the city comes alive in these spaces, too. Splashes of yellow seem to pervade corridors – an intentional tribute to the yellow cabs. Bold, colourful graffiti has replaced the unsexy shades of grey that once dominated offices. In some workplaces, you’ll even stumble across a hideaway speakeasy or a diner. Designers across the pond love playing with scale – perhaps a subtle reference to the Manhattan skyline. Once upon a time, A&D was in the throes of a ‘branding crusade’ – a mission to stick to the corporate colours and sweat the logo as much as feasibly possible. Now, the dial has turned to subtlety and suggestion. Today, colour is used to create a mood and energy. It’s no longer a mere slap-in-the-face reminder of a brand’s identity. It speaks to its people as opposed to just its prospective customers. And then, of course, there’s a whole movement towards health and wellness. There seems to be a better understanding of the impact that certain materials can have on people, and how the space can impact our cognition and stress levels. Environmental sustainability has made great strides, then, and there is a focus on improving lives through active and passive intervention. 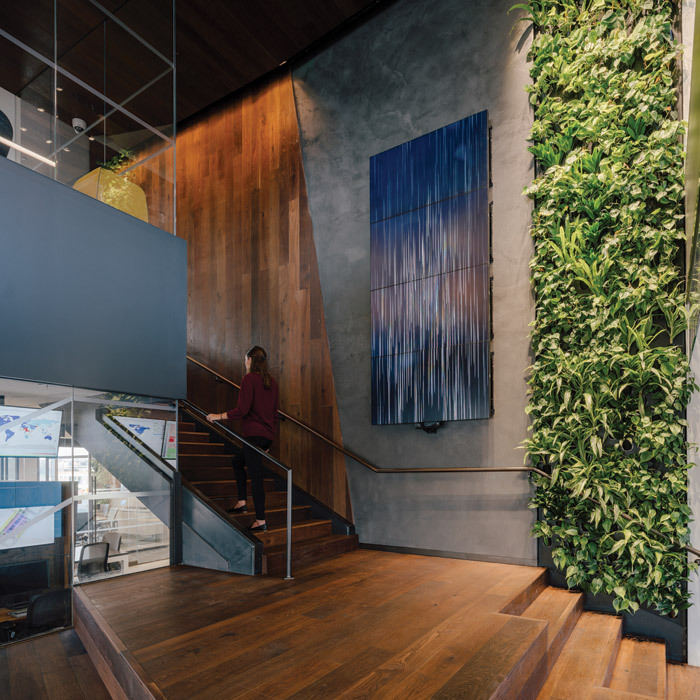 More companies are giving employees access to daylight, fresh air, views, greenery and state of the art filtration systems – not because they’re trying to tick a box, nor to secure acclaim for the high-end buildings they can afford to provide, but because they genuinely care.